This junior edition of Stewart’s lurid 2011 portrait gallery of the same name (though much less gleeful subtitle) loses none of its capacity for leaving readers squicked-out. The author drops a few entries, notably the one on insect sexual practices, and rearranges toned-down versions of the rest into roughly topical sections. 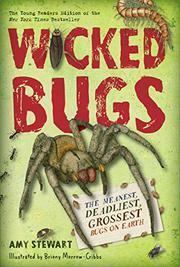 Beginning with the same cogent observation—“We are seriously outnumbered”—she follows general practice in thrillers of this ilk by defining “bug” broadly enough to include all-too-detailed descriptions of the life cycles and revolting or deadly effects of scorpions and spiders, ticks, lice, and, in a chapter evocatively titled “The Enemy Within,” such internal guests as guinea worms and tapeworms. Mosquitoes, bedbugs, the ubiquitous “Filth Fly,” and like usual suspects mingle with more-exotic threats, from the tongue-eating louse and a “yak-killer hornet” (just imagine) to the aggressive screw-worm fly that, in one cited case, flew up a man’s nose and laid hundreds of eggs…that…hatched. Morrow-Cribbs’ close-up full-color drawings don’t offer the visceral thrills of the photos in, for instance, Rebecca L. Johnson’s Zombie Makers (2012) but are accurate and finely detailed enough to please even the fussiest young entomologists.